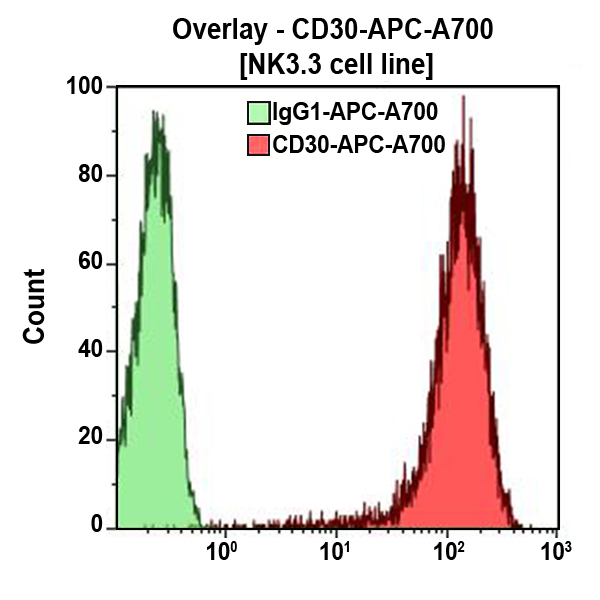 The CD30 antigen is a single-chain glycoprotein with a molecular weight of 105 kDa (Ki-1 antigen). It is a member of the TNFR (Tumor Necrosis Factor Receptor) superfamily and binds to CD153 (CD30 ligand). CD30 antigen is found on activated T and B lymphocytes and on Reed Sternberg cells. *Alexa Fluor and Pacific Blue are registered trademarks of Molecular Probes, Inc.